Our technology allows entirely new insights in disease mechanisms and revolutionizes personalized medicine as well as companion diagnostics for a better healthcare. Mass spectrometry (MS)-based proteomics enables the parallel identification, characterization and quantification of hundreds to thousands of proteins even in the most complex biological samples. The general workflow consists of sample collection (1), sample preparation (2), optional pre-fractionation (3), liquid chromatography coupled to a mass spectrometer (4), data processing (5) and analyses (6). Today, laboratories are struggling with slow, irreproducible, non-robust and non-sensitive proteomic sample preparation workflows. These workflows are time consuming and cannot be automatized. This leads to loss of money, time, and precious samples. Limitations are: Elaborate sample preparation, insufficient reproducibility, missing automatization and missing quality control & standardization. PreOmics addresses these limitations and our technologies enable a robust and reproducible sample preparation with a significant time advantage compared to its competitors, which is essential for reliable and informative results. 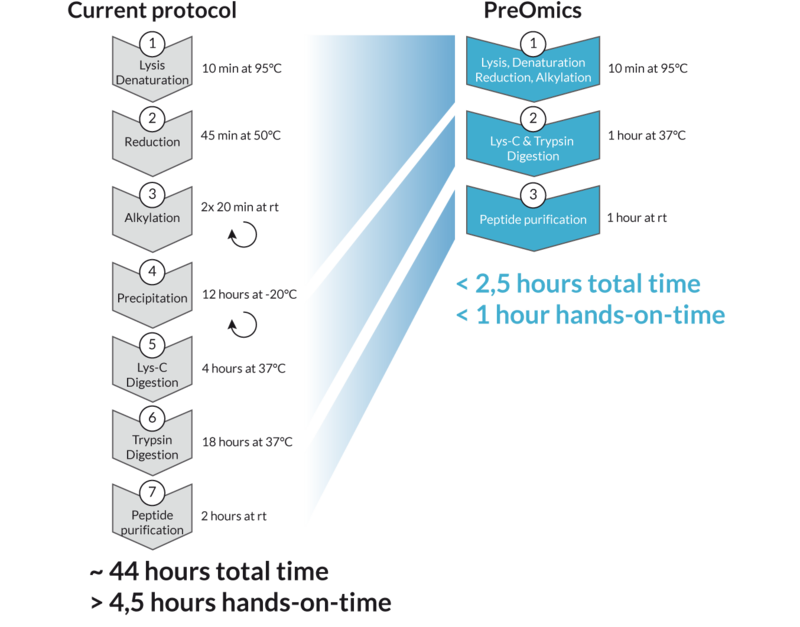 Current protocols need more than 44 hours total time and 4.5 hours hands-on-time. PreOmics reduces these times down to 2.5 hours total and 1 hour hands-on-time.